I am wary of visionaries, but found this talk by Allan Savory fascinating. . .
More information is available at the Savory Institute; and there is a balanced critical assess­­ment by Chad Kruger, here and here. This blog post combines Richard Feynman with Wislawa Szymborska. As a bonus, it also links to Maria Popova’s Brain Pickings. A molten salt reactor cannot melt down because the normal operating state of the core is already molten. The salts are solid at room temperature, so if a reactor vessel, pump, or pipe ruptured they would spill out and solidify. If the temperature rises, stability is intrinsic due to salt expansion. In an emergency an actively cooled solid plug of salt in a drain pipe melts and the fuel flows to a critically safe dump tank. The Oak Ridge MSRE researchers turned the reactor off this way on weekends. Hargraves and Moir also explore the cost advantages of LFTRs and the difficulties that LFTRs would pose to prolifera­tion and weaponization. The occasion for the Chronicle interview is Sherry Turkle’s new book, Alone Together: Why We Expect More from Technology and Less from Each Other, which remarks that “we talk about ‘spending’ hours on e-mail, but we too are being spent.” I also enjoyed the observation by Turkle’s daughter, that instead of a robot caretaker the professor “would rather have the com­plete works of Jane Austen played continu­ously.” Me too. 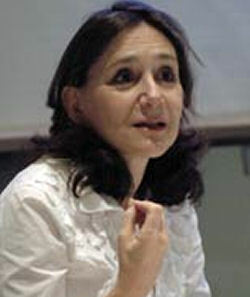 Sherry Turkle is the Abby Rockefeller Mauze Professor of the Social Studies of Science and Technology at MIT, and is the director of the MIT Initiative on Tech­nology and Self. She earned her doctorate in sociology and per­son­ality psychology from Harvard University, and is a licensed clinical psycho­logist. She writes about the “subjective side” of the relationship between people and technology. I first read The Second Self: Computers and the Human Spirit nearly twenty years ago and have often assigned it to students. Turkle describes how children use com­puters as evocative objects — “things to think with” — which assist them in understanding their own capa­ci­ties and limi­tations. Thus, the sense of self that emerges in children who have grown up with computers can differ from that in children who have grown up with, say, animals and pets — the experience of the former suggesting the spe­ci­fic difference and genus feeling machine, rather than the traditional Aristotelian rational animal. This kind of revision in our understanding of who we are, it seems to me, marks a profound cultural transition — and it is important that we con­sider the pos­si­bility that our technology can induce deep changes. In an article for Wired, Uranium is So Last Century, Richard Martin touts the promise of thorium fueled nuclear fission. Unlike uranium, thorium is plentiful in nature and produces a “miniscule” amount of radioactive waste. It is also an effective breeder and lacks the weaponization potential of uranium. The tech­nology is called LFTR — for Liquid Flouride Thorium Reactor — and seems to be fairly well understood. There is a blog called Energy from Thorium, by Kirk Sorensen, which keeps up with the latest news and has useful links and discussion. Like Polywell fusion, the development of thorium reactors could be funded at a small fraction of the anticipated cost of cap and trade. If we are serious about the threat of carbon-induced warming, then we ought to explore serious energy alter­natives. A profile, Centre of the Storm, from Macleans.ca. Last week an unknown hacker — or inside whistleblower — distributed on the internet emails and documents apparently taken from the computers of the Climatic Research Unit at the University of East Anglia in England. The CRU and its director, Phil Jones, have been central players in promoting the theory of anthro­pocentric global warming that is endorsed by the IPCC. In conjunction with the Hadley Centre of the U.K. Met Office, they maintain HadCRUTv3, one of the main datasets of global temperature. By now the purloined files have been disseminated throughout the internet, and have created quite a stir. The original zip file (62 MB) is here; when unzipped it contains about 160 MB of information, with over 1000 emails and 2000 other documents. The blogosphere has primarily focused on the emails, which include exchanges between Phil Jones and many leading climate scientists. There is now a searchable database of the emails and Bishop Hill provides a synopsis of some of the more interesting cases. The other documents — with data, code, and financial records — will probably have a greater impact over the long run. There are questions, for instance, about coding practice — see here. Evidence so far seems to indicate that all of this material is genuine; many recipients have confirmed the accuracy of emails, and as yet nothing has been disputed. Several weeks ago I went on a binge reading about Polywell fusion. The brainchild of Dr. Robert Bussard, Polywell fusion is a variety of inertial electrostatic confinement, a combination of the inertial confine­ment (IFE) and magnetic confine­ment (MFE) ap­proaches to plasma con­tainment. The idea is to use a polyhedron of electromag­netic coils into which electrons are intro­duced. The electrons become concen­trated by the mag­ne­tic and electrical fields at the center of the device, creating a well of electro­static potential that confines the ions for fusion. Advantages claimed for this approach are that it does not release any radioactive byproducts, and that it is highly scalable. One conse­quence of the latter is that the time and expense required for development is considerably less than with, e.g., the Tokamak design. For more information, see the Wikipedia entry on Polywell fusion and the Talk-Polywell discussion forum. In 2006, Dr. Bussard gave a talk at Google — primarily to solicit funding. This talk is interesting not only as an introduction to the idea of Polywell fusion, but also for Dr. Bussard’s remarks on aspects of the institutional culture of science. Low-level funding for Polywell fusion was provided to Dr. Bussard’s company, Energy Matter Conversion Cor­poration, by the Navy from 1992 to 2005. Funding was resumed in 2007, shortly prior to Dr. Bussard’s death. Last month, the Department of Defense announced a contract of $7,855,504 for “validation of basic physics,” to be completed by April, 2011. We could fund thousands of such ideas for less than the cost of cap and trade. 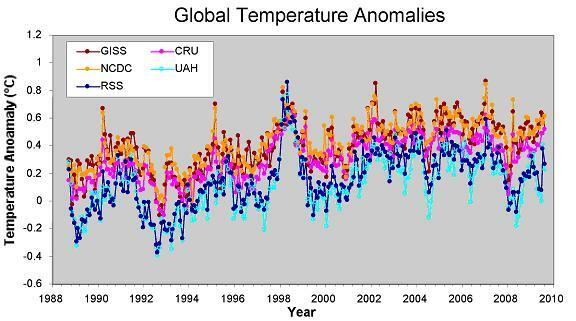 Steve McIntyre of Climate Audit seems to have broken the hockey stick for a second time. In Yamal: A “Divergence” Problem, he asks troubling questions about the Briffa tree ring chro­no­logies used in many recent reconstructions of temper­ature history. Here is Briffa’s response to McIntyre and McIntyre’s reply. * For those new to this story, Bishop Hill’s The Yamal Implosion may be helpful. 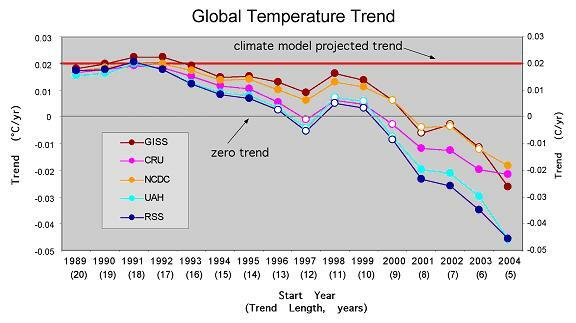 1) The benefit, as measured by the extent of the decrease in global warming, seems to be negli­gible. According to a recent analysis by Chip Knappenberger, reduction of U.S. CO2 emissions to 83% below 2005 levels by 2050 — which is the goal of the Waxman-Markey bill — would only reduce global temperature by 0.05° C. Even in the highly unlikely event that the entire world were to follow suit and reduce CO2 emissions by the same amount, the resulting reduction in global temper­ature by 2050 would still be less than 0.5° C. — see here. This analysis assumes the IPCC mid-range or high-range emis­sions scenarios; for low-range scenarios the temper­ature change would be even less. Knappenberger uses the so-called MAGICC simulator (the Model for the Assess­ment of Green­house-gas Induced Climate Change) which you can down­load in order to run the calculations for yourself. I think Freeman Dyson is a good scientist. Last summer I sent various friends a link to his NYRB essay, The Question of Global Warming. But I am somewhat surprised — and this may indicate my own bias — to see the doubts of a leading scien­tist displayed so visibly by the New York Times. Is this perhaps a concession that the science is not yet settled? Will we next see a discussion in the Times of, say, Roger J. Pielke, Sr. or the scientists at Climate Audit? Murray observes that there are only four “institutions” in society within which human beings can achieve this kind of deep satisfaction: family, community, vocation, and faith. The stuff of life — the elemental events surrounding birth, death, raising children, fulfilling one’s personal potential, dealing with adversity, intimate relationships — coping with life as it exists around us in all its richness — occurs within those four institutions. Finally, Murray suggests that America needs another political Great Awakening, a re­discovery “in the gut” of what is most valuable in life. There are some big ideas in this essay. Read it for yourself. I found Steven F. Hayward’s All the Leaves are Brown quite absorbing. It is a review of recent environ­mental writing, covering both tendencies toward authori­tarianism in the green move­ment and some promising new approaches from the left in the writing of Ted Nordhaus, Michael Shellenberger, Seymour Garte, Orrin H. Pilkey and Linda Pilkey-Jarvis. Update, 11/09: See Nordhaus and Shellenberger at The Breakthrough Institute. The shift from classical to intuitionistic logic, as well as the requirement of predicativity, reflects a conflict between the classical and the constructive view of the universe of sets. This also relates to the time-honoured distinction between actual and potential infinity. According to one view often associated to classical set theory, our mathematical activity can be seen as a gradual disclosure of properties of the universe of sets, whose existence is independent of us. This tenet is bound up with the assumed validity of classical logic on that universe. Brouwer abandoned classical logic and embarked on an ambitious programme to renovate the whole mathematical landscape. He denounced that classical logic had wrongly been extrapolated from the mathematics of finite sets, had been made independent from mathematics, and illicitly applied to infinite totalities. This article might interest our BA Seminar students, as well as students in Programming Languages who have recently encountered Curry-Howard Isomorphism — the correspondence between intuitionistic logic and CLK. A fair summary of the North and Wegman Reports, in my opinion, is given by Steve McIntyre here. A Formal Response to Gavin Schmidt (also, see his comment #2). Original sources on this latter dispute can be found at RealClimate and ClimateAudit. Altogether, it was not a great week for civility in science.